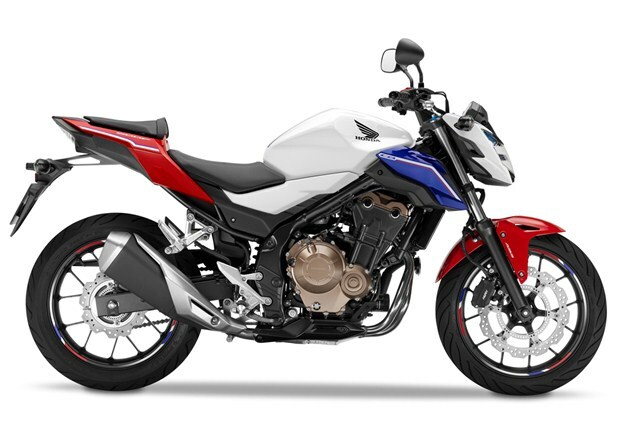 HONDA introduces its updated CB500F in Milan. Thanks to some teaser images released last week, we've had a glimpse of this new model, but this is the first time we've seen the whole of it. For 2016 Honda has made the CB500F a more tempting proposition for A2 licence holders by shapening it up and making it sleeker thanks to reduced side panels and a new tail unit. The 2016 models has also gets a new, larger fuel tank, LED lighting, spring preload adjustable forks, a new lightweight exhaust and adjustable brake lever. It will be available in six different colour options - Ross White and Millennium Red (Tricolour), Lemon Ice Yellow/Graphite Black, Candy Energy Orange/Macadam Grey Metallic, Millennium Red/Macadam Grey Metallic, Pearl Metalloid White/Macadam Grey Metallic, Matte Gunpowder Black/Matte Krypton Silver Metallic. 'The CB500F joined Honda’s mid-sized line-up in 2013. Compact in size but punching way above its weight, it injects the adrenaline and excitement of full-sized motorcycle ownership into every ride for A2 licence-holders moving up from a 125cc; at the same time, its all-round agility, punchy performance and sensible running costs make it a great motorcycle with which to commute through the week and ride for pleasure at the weekend, whatever the rider’s experience level. 'The 2016 CB500F is a bold evolution that elevates the machine still further, with a shot of naked streetfight style and rider-focussed upgrades that add more fun, pride of ownership and desirability. 'A larger 16.7 litre fuel tank extends range, and detail improvements such as hinged fuel cap, adjustable-reach brake lever and ‘wave’ style ignition key elevate the overall owning experience.